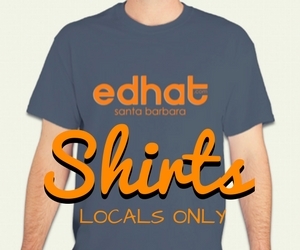 Sunday, April 28th | 2 p.m. • Thursday, May 2nd | 7 p.m.
Edhat Santa Barbara will host their 15th Anniversary Celebration Party on Wednesday, April 24, from 5:30-7:30 pm at Carr Winery ( 414 N. Salsipuedes St., Santa Barbara). This is a free, 21 years of age and over, community event that will include light appetizers, birthday cupcakes, a raffle with prizes, and live music. Wine will be available for purchase. The Spirit and Jr. Spirit of Fiesta have been selected following the annual dance competition held this past Saturday. Meet Maisy, Molly, Sparkle, and Carlos, four 12-week old puppies that are ready for adoption. Meet them at the Edhat 15th anniversary party! Meet Eliza, a precious kitty who's on the mend and looking for a temporary foster. A Buellton structure that stored equipment was destroyed in a fire on Saturday morning. The Community Environmental Council (CEC) will host its 2019 Santa Barbara Earth Day Festival at Alameda Park Saturday, April 27 from 11 a.m. to 8 p.m. and Sunday, April 28 from 11 a.m. to 6 p.m., with a bonus free evening concert including Beer & Wine Garden on Friday, April 26 from 5 p.m. - 9 p.m.
[Update]: A private party at the Four Seasons Biltmore Hotel included surprise fireworks startling many local residents Thursday night. First United Methodist Church of Santa Barbara installed rainbow-colored banners to stand in solidarity with the LGBTQIA+ community. Santa Barbara's downtown Paseo Nuevo shopping mall broke ground on Tuesday for a $20 million renovation. Santa Barbara County firefighters extinguished a one-acre fire in Santa Ynez on Tuesday afternoon.